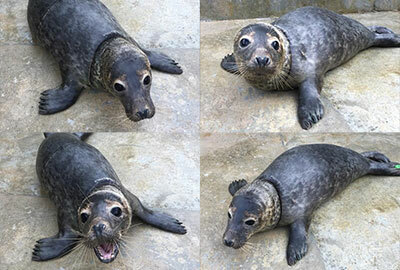 Harry, 16 weeks old male seal, was rescued by members of the British Divers Marine Life Rescue (BDMLR) from a beach in the West Country on 19th May 2018 with monofilament fishing net stuck around its neck. 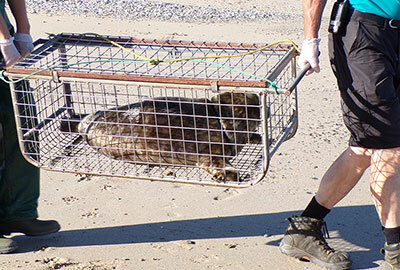 Volunteers helped with the successful transfer of this seal to the Sanctuary´s local vet where it was treated for a cut neck and high temperature. Update - 3rd June 2018 : Harry is now in the outside pool for his final stage of rehabilitation and he will be returned to the wild in the next few weeks. His flipper tag number is 374 (green). Click here to see a collage of photos of Harry. Update - 23rd June 2018 : Harry is currently in the rehabilitation pool ready to be released back to the wild. 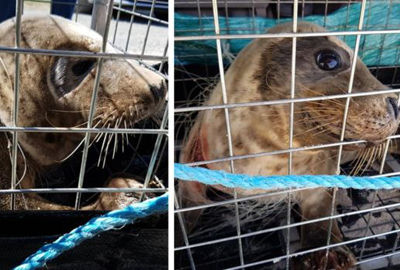 Update - 1st July 2018 : Harry was one of the last seal pups from winter rescue to be released back to wild on 28th June 2018 at Porthtowan beach along with another rescued pup named Bella. Click here to read more. Update - 23rd February 2019 : Harry was seen at a local haul-out along the west coast of Cornwall on 18th February 2019. 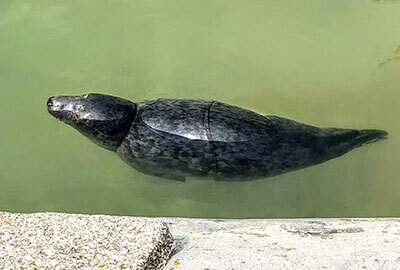 Click here to see a larger photo (right) of Harry taken by Sue Sayer of the Cornwall Seal Group Research Trust on 18th February 2019. 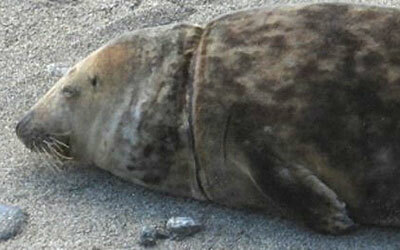 Members of the Cornwall Seal Group Research Trust who identifies and monitors local seals.